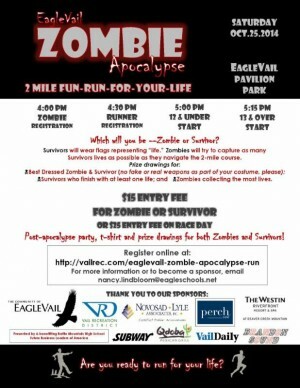 The Vail Recreation District invites runners to “run for their lives” Saturday, Oct. 25, during the EagleVail Zombie Apocalypse 2 Mile-Fun-Run-For-Your-Life. Participants in this two-mile obstacle course can choose to be either a Survivor or a brain-hungry Zombie and will be forced to outwit, outrun and outlive each other in a race like no other. The event will be followed by a Post-Apocalypse Party with food, music and prizes. Proceeds benefitting Battle Mountain High School’s Future Business Leaders of America and the Eric Spry Memorial Scholarship Fund. Participation in the race – as either a Zombie or a Survivor – costs $15 to pre-register or $25 on race day. Zombie runner registration and check-in will take place at 4 p.m. at the EagleVail Willow Creek Par 3 Clubhouse, while Survivor runner registration and check-in will take place at 4:30 p.m. at the EagleVail Pavilion. The race will begin at 5 p.m. for ages 12 and younger and 5:15 p.m. for ages 13 and older. This is the final race of the VRD’s running race season. Throughout the summer, the VRD has offered more than 11 running races, from half marathons to 5ks to fun runs, with thousands of runners from across the Colorado, the nation and the world participating. The VRD will kick off its 2015 running race season in March with the annual 10k and 5k Shamrock Shuffle snowshoe race, followed by the return of the La Sportiva Vail Mountain Trail Running Series in May. 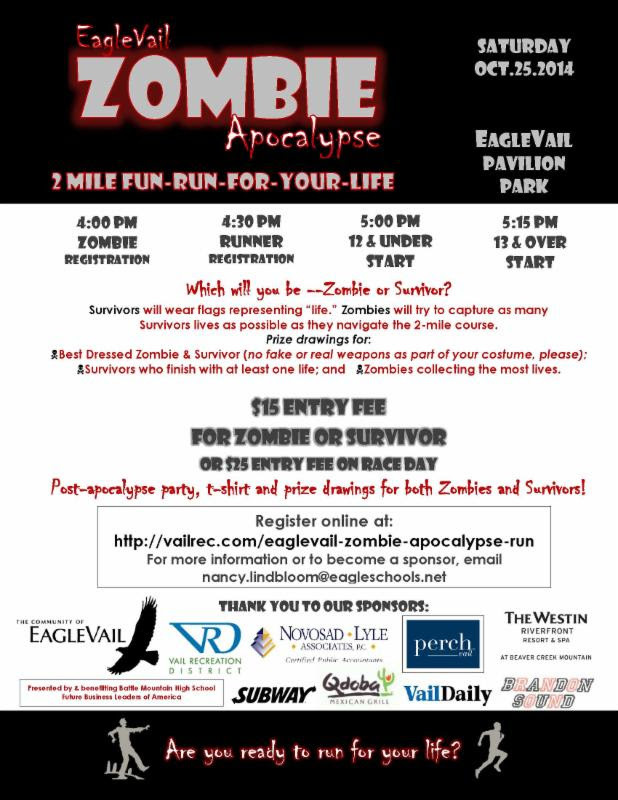 To register or for more information, visit www.vailrec.com/eaglevail-zombie-apocalypse-run or contact Nancy Lindbloom with BMHS at nancy.lindbloom@eagleschools.net.